Parents should not think that they can or must make the world completely safe for a child. You cannot stop an earthquake or tornado from happening. But there are important steps you can take to protect your child from common hazards. Car crashes, burns, and falls hurt many children every year. 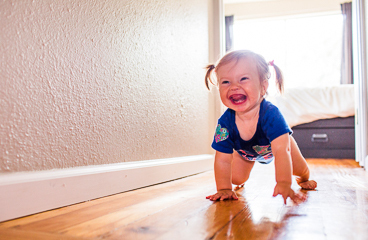 Your home can be full of hazards for a curious child. Prevent injuries by using safety equipment, teaching your child how to be safe, and watching him or her closely. Taking care of yourself is a vital part of keeping your child safe. Although minor injuries can occur at any time, most happen during times of stress. They often occur right after work and before dinner, when parents and children are hungry and tired. Be prepared for an emergency. Teach your child how to get help from an adult or to call 911. During bath time, always stay within an arm's reach of your child, and never leave your child alone in the tub—even when an older child is present in the room or in the tub. Do not give your baby toys that have strings, cords, or small removable parts that may cause your baby to choke. Also avoid necklaces and balloons. Keep cords for blinds, drapes, and telephones out of your child's reach. Do not let your child use laser pointers or laser toys. These can cause lifelong eye damage if the laser is pointed at the eye. Keep your child away from fire, steam, hot water, and other hot liquids and objects. Turn your hot water heater's temperature down to 49°C to help prevent burns from hot water. Do not drink hot liquids near your child. Prevent household fires by having and maintaining smoke detectors. Plan and practice escape routes. Screen off fireplaces and other heat sources. Consider buying flame-resistant pyjamas for your child. Once your child can walk, lock doors to all dangerous areas. Use sliding gates at both ends of stairs. Do not use accordion-style gates, because a child's head could get caught. Do not let your child play with plastic sacks, and keep them out of his or her reach. Unplug appliances when not in use. Keep electrical cords out of your child's reach. Use safety covers on all electrical outlets. Keep a fire extinguisher in your kitchen. Properly store products that can be poisonous. This includes cleaners and other chemicals, plants, medicines, and any other products that might harm a child. Keep them out of the reach of young children. Keep the phone number for your provincial poison control centre near your phone. Use child-proof window locks or guards on all windows above the first floor. Unload all guns and keep them locked up. Keep the ammunition in a separate locked place. Learn the signs of choking so you can react quickly. For example, a child who is choking cannot talk, cry, breathe, or cough. Be aware that young children can choke on small objects, such as a nut or raisin. Never leave rubber bands or balloons around the house where children can reach them. Do not allow young children to eat lollipops, hard candy, or gum. Do not heat bottled formula or breast milk in the microwave because hot spots in the liquid can burn a baby's mouth and throat. Use a car seat for every ride in a vehicle. For safety, it is very important to have a car seat that fits your child and faces the right direction. Securely strap your child into a properly installed car seat that meets all current safety standards. The safest place for your child is in the back, middle seat of the car. Do not allow your child to play near the garage or driveway or around cars. Make a habit of checking under and behind your car before driving. When out of the car, always lock car doors, and keep the keys out of your child's sight and reach. Never leave your child alone in the car (even if it is just for a "second"). Never leave your child unattended, even for a moment. In stores, strap your child in a stroller or grocery cart so that he or she cannot lean out. When around water, do not let your child use inflatable swimming aids (such as "water wings") without constant supervision. They can deflate, or a child can slip out of them. Learn to swim if you do not already know how. Teach your children not to approach unknown animals and not to chase or grab pets. Sunburns can permanently damage a child's skin. Keep babies younger than 12 months out of the sun. If you cannot avoid the sun, use sunglasses, a wide-brimmed hat that covers the back of the neck, and clothing to protect your child's skin. Put sunscreen and lip balm with sunscreen (SPF 30 or higher) on your child before he or she goes outside. Do not use sunscreen on babies younger than 6 months old. Never let your child play in or near irrigation canals. Help your child understand the danger of strangers. Most children who are abducted are not taken by strangers, but rather by a parent, relative, family friend, or acquaintance. But it is still important to teach your child to be cautious of strangers and how to react when he or she feels threatened. Before your child visits an unfamiliar home, ask the owner whether you need to be aware of any dangerous areas, pets, or other safety issues. In addition, it is always a good idea to check out the household yourself. Enter X624 in the search box to learn more about "Child Safety: Care Instructions".